Photograph of Gambier Terrace, off Hope Street, Liverpool, which is a quintessential example of Georgian architecture in the city. It is situated opposite the Anglican Cathedral with spectacular views over the Cathedral, city and river beyond. The terrace was built between 1832-7, thought to be to the designs of John Foster Junior. 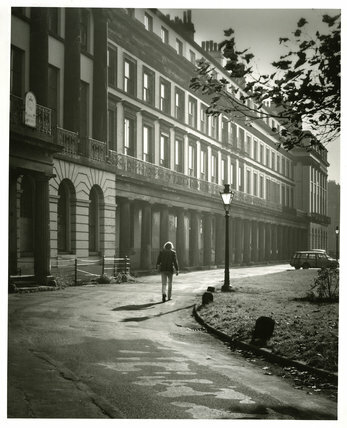 The photograph shows a man walking towards the terrace and past a street lamp. Branches from a tree and visible in the top right hand corner of the composition.